ElectronicKitSchool. - This is one information update from sensor technology news 2017 in this time with the article titled DARPA’s New Sensor Can Work for Years With Almost No Power that written by Brad Jones. 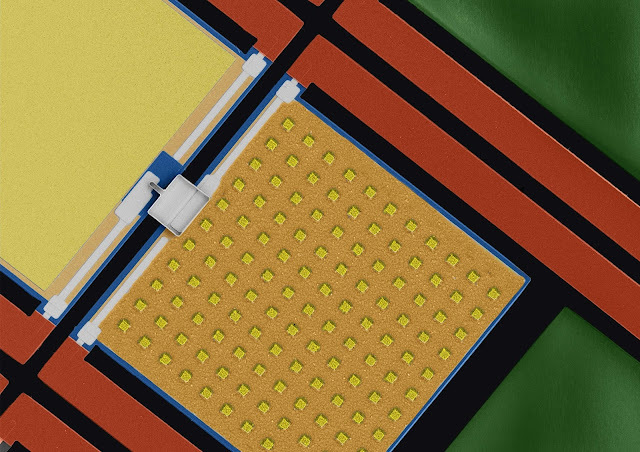 Researchers at Northeastern University have developed a groundbreaking new sensor for DARPA. The device is capable of recognizing infrared wavelengths without the need for an external power source. A team of researchers at Northeastern University have developed a new sensor powered by the very infrared energy it’s designed to detect. The device, which was commissioned as part of DARPA’s Near Zero Power RF and Sensor Operation (N-ZERO) program, consumes zero standby power until it senses infrared (IR) wavelengths. Energy from this source heats the sensing elements, prompting mechanical movements that close a circuit and beam out signals confirming that the IR wavelengths have been detected. A grid of nanoscale patches forms a logic circuit, with each patch being constructed with specific dimensions corresponding only to the wavelengths it’s designed to detect. Consequently, the circuit can be altered to analyze various IR spectra. It’s possible for the sensor to simply detect IR wavelengths in its surroundings, or determine whether the energy that has activated it came from a fire, a person, or some other source. A sensor like this is advantageous because it can be placed absolutely anywhere, without the need for a power supply, or access to solar energy. Such versatility sounds like wetware of William Gibson’s Neuromancer, so it’s no surprise it’s fallen into DARPA’s cross-hairs. And now you read more about DARPA’s New Sensor Can Work for Years With Almost No Power by Brad Jones from original source using link HERE.